Shell Helix Ultra SN PLUS 0W-20 is a fully synthetic motor oil created to provide superior wear and corrosion protection, while also protecting vital engine parts and horsepower from the extreme stress and high-temperature attacks experienced in high-performance engines to provide long-lasting engine performance. It is designed to better protect modern turbocharged engines from low-speed pre-ignition (LSPI), which can cause damages to vehicle engines like ‘super knock’, broken spark plugs, cracked pistons and engine failure. The new product has been developed with Shell PurePlus Technology, which converts natural gas into base oil. This base oil is used by Shell Oman’s Lubes Blending Plant in Mina Al Fahal to produce Shell Helix Ultra SN PLUS 0W-20 which is made in Oman for local and international markets. 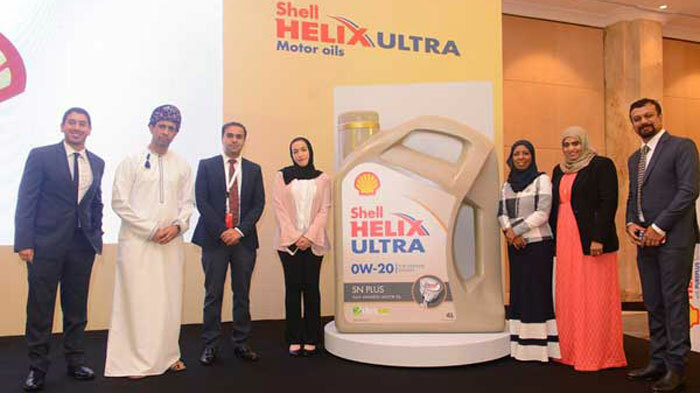 “The new product is compliant with the new American Petroleum Institute (API) SN PLUS standard,” said Mahmoud Al Abri, commercial lubes manager, Shell Oman. “Thanks to our advanced Shell PurePlus Technology, we have been able to develop the Shell Helix Ultra SN PLUS 0W-20, a fully synthetic product that is perfectly designed to better protect modern turbocharged engines,” he said.